Lesson 53 - Reaching The World With Power! 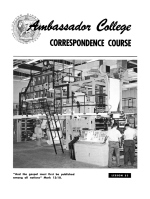 Ambassador College Press personnel operate newly installed Halley Aller webfed magazine press. This giant machine, which prints THE PLAIN TRUTH, is a REVOLUTIONARY IMPROVEMENT over the Gutenberg Press (pictured on the cover of Lesson 52) which printed the Bible in the 1450's. Modern four-color web-fed presses can now print in a few hours what it once took months — even YEARS — to print! Up-to-date press facilities, and the latest in radio and television studio equipment, enable God's Work to proclaim Christ's message worldwide with AWESOME POWER! REACHING THE WORLD WITH POWER! Jesus said His Church would never die (Matt. 16:18). But what happened to God's Church after the Thyatira Era? Where, and under what circumstances, did Christ CONTINUE His Church? This concluding lesson on the history of the true Church of God reveals the exciting details. It gives the story thread up to the present, showing WHERE God is working today — and WHY! THE history of God's Church is utterly DIFFERENT from what most people believe. And it is TOTALLY DIFFERENT from the history of this world's churches. Its history stands revealed in the first three chapters of Revelation. The one True Church began with Jesus Christ and the disciples He specially chose and trained to carry on the work He began. Through all ages — in every generation — that Church has continued to exist. Each era of the Church of God has continued until, and led up to, a succeeding era. Today, we are in the "Philadelphia" Era of God's Church. It continues to carry on the Work of God — reaching the world with GREATER POWER THAN EVER BEFORE! Let's turn back, for a moment, the pages of history. How did the Church Jesus built come to be where it is today? Here is what we find: The Ephesian Era lost its "first love" (Rev. 2:4). It ceased to actively carry God's truth to the world. It went to sleep spiritually (Matt. 25:5). Jesus Christ therefore REMOVED its "candlestick," and continued His Work through the "Ebionites" or "poor people" of the Smyrna Era, who were rich in faith. There were Smyrna Era Christians — mostly Greeks — in western Asia Minor (the Roman province of Asia). And there were others — mostly Jews — in the mountains and plain of inner Syria. History shows that many Christians of this era were persecuted to death. Yet centuries later the Church of God was still in existence! Some of the congregations of God's Church had migrated eastward. They became the original "Paulicians" (descendants of those congregations raised up by the apostle Paul) in Pontus (Armenia), of the Pergamos Era. Still later, the Paulicians were forced into Europe. It was as a direct result of their evangelization of parts of Italy, France and Germany that the work of the Thyatira Era was raised up. There Jesus Christ inspired and empowered such men as Peter of Bruys, Henry, Peter Waldo and others who had received God's truth from this same source. These true Christians, as well as many who merely SYMPATHIZED with them, were called "Waldensians" by the world. Most of the LATER Waldensians — during the long Thyatira Era — were not converted. These people merely sympathized with the truth. They were not willing to give their very lives for it. When the going got rough, they dropped away from what truth they had received, often neglecting the Sabbath and condoning the partaking of Mass. Now to refresh our memories as we begin this final lesson on true church history. Recall that it was prophesied, hundreds of years before Christ, that the number of true Christians in the Middle Ages would be reduced almost to the vanishing point — that the "little horn" (the papacy) would "wear out the saints" (Dan. 7:25). From such a background — where the truth of God was about to perish (Rev. 3:2) and only a very few were converted members of the true Church — Jesus Christ raised up a new era of God's Church. It was in England that He chose to raise up the "Sardis" Era. But, sadly, the lack of real spirituality continued to permeate this era of the one true Church of God. 1. Does Christ verify that the "Sardis" Era began at this time when His truth was in danger of being completely forgotten? Rev. 3:2. Were these people exhorted to GET BUSY (BECOME watchful, or "wake up" — according to the original Greek) and "STRENGTHEN the things which remain, that are READY TO DIE"? Same verse. COMMENT: Much was lacking in the doctrine and practice they received from the latter end of the Thyatira Era. Proper organization and government in the Church were in great need of strengthening. And they desperately needed a school for the training of a qualified ministry. 2. What does Jesus Christ say is the outstanding characteristic of the "Sardis" Era of His Church? Rev. 3:1. COMMENT: Sardis had a "name" (a position or office) as one of the seven LIVING eras of God's Church, but was, according to the inspired original Greek, as if DEAD! Of all the seven churches, Christ has the least to say to Sardis. For there were only a very FEW in the Sardis Era who had not DEFILED their garments, spiritually speaking (verse 4). Significantly, the site of the ancient city of Sardis is completely deserted today. Nomad Turkish herders pitch their tents near a place they call Sart. Its DEAD condition symbolizes the spiritual condition of the Sardis Era of the Church of God! About 1585, almost immediately after the end of her 1260 years in the wilderness, God's Church began to revive — this time in England. In the reign of Elizabeth (1558-1603), states Chambers' Encyclopedia, article "Sabbath," "many conscientious and independent thinkers" advocated the seventh day. Most of them, although they saw the truth about the Sabbath, were not really converted in heart and mind. A "great disputation" about the Sabbath arose. Oh yes, they could argue for the Sabbath, but would they fully surrender to the government of God? Sabbath keepers now commonly came into historical view. Books were published urging the keeping of the seventh day. One of those not satisfied with Puritan SUNDAY observance was a stentorian-voiced minister named John Traske. Traske also understood the truth concerning unclean meats. He ordained four evangelists about 1616, whose labors resulted in the conversion of many. Because of these things, Traske was censured in the Star Chamber, set on the pillory, publicly whipped and then imprisoned. Three years later, having written and published a recantation — "a brief and silly treatise" — he obtained his release, and "afterwards relapsed, not into the same, but other opinions rather humorous than hurtful" (Cox's "Literature of the Sabbath Question", Vol. I, p. 157). His wife died in prison after having been confined about 15 years for holding fast to the Sabbath. Cox continues, "THIS SECT AROSE IN GERMANY IN THE 16TH CENTURY." He means they had been among those the world loosely called Anabaptists, among whom were Sabbath keepers such as those in Bohemia (mentioned by Erasmus) and elsewhere. Later, official pressure was brought to bear on Brabourne. He "became a convert, conforming himself quietly (though temporarily) to the Church of England. HIS FOLLOWERS, HOWEVER, DID NOT ALL ACCOMPANY HIM BACK TO ORTHODOXY" (Vol. 1, p. 220; Vol. 2, p. 6). About this time Philip Tandy, a minister of the established church in the north of England, saw the truth concerning the Sabbath and the true mode of baptism, and abandoned that church. Another book in defense of the Sabbath was written by James Ockford, and published about 1642. His enemies called him an Anabaptist. At this time, those who CALLED THEMSELVES THE CHURCH OF GOD were commonly and "falsely called Anabaptists" (Underhill, "In Confession of Faith and Other Public Documents", quoted in "A History of the True Church", by Dugger and Dodd, pages 242, 246). Many others throughout the 1600's and 1700's also wrote and published works expounding and defending Biblical truth, in particular the commandment to keep God's Sabbath. God's Church was beginning to use Christ's gift of the printing press, though still not with the zeal which was needed. PHOTO CAPTION: ANCIENT SARDIS — Part of the ruins of ancient Sardis. The two lone columns seem to symbolize the truth of Jesus' statement: "Thou hast a few names even in Sardis which have not defiled their garments ..." (Rev. 3:4). Not much is known of the congregations and local members of the true Church during the first decades of the 1600's. A veil necessarily hung over the activities of God's people, because it was still illegal for them to hold Sabbath meetings for worship and preaching. All was not easy for these people of God. At least two ministers were MARTYRED for preaching and conducting religious services outside the established church ("The Seventh Day Baptists in Europe and America", p. 78). We know that one of the London churches goes back at least to the time of Traske and the four evangelists whom he ordained. Evidence is that this "Mill Yard" congregation dates from 1607, or even the 1580's. Positive evidence is extant for the existence of several other congregations in the 1650's. By 1668, there were in England "nine or ten congregations besides numerous scattered believers in other places." So wrote the famous seventh-day minister, Edward Stennett, to Rhode Island members not yet organized into a local church. Stennett addressed the Rhode Island members as "the remnant in Rhode Island who keep the commandments of God and the testimonies of Jesus" — see Rev. 12:17 (Cox, "Literature of the Sabbath Question", page 267). The famous Stennett family, which provided ministers for the Church of God in England for four generations, is one example of the fact that Jesus Christ often works through FAMILIES. Christ also used more than one member of several other families to proclaim His Word in this era. Among them were the Bampfield brothers — Francis and Thomas — about 1675. Both of them wrote and published books on the Sabbath, creation, the Law of God, etc. In Francis Bampfield's book, pages 28, 58-60, the name of the Church is "THE CHURCH OF GOD" (Dugger and Dodd, "A History of the True Church", p. 241). Francis Bampfield was driven from his Church of England pastorale in Devonshire by the 1662 Act of Conformity. Much of his remaining life was spent in various jails. He raised up a small Sabbath-keeping congregation within the walls of Dorchester jail. When released, he began to hold meetings in London in his own hired house — much like the Apostle Paul did in Acts 28:30-31 — and then organized a congregation that continued over a hundred years. When seized again, he soon died in prison. Edward Stennett then became the pastor of this church. 1. What did Christ exhort His people in the Sardis Era to remember? Rev. 3:3. COMMENT: They were told to remember HOW they had received the truth. They received it from those in the preceding Thyatira Era who HAD HELD FAST (Rev. 2:25) to the death! — NOT from those who had fallen away from the truth. Yet, through fear of persecution — in England and later also in America — many of God's people continued to fellowship with those who had fallen away, and even with some of the churches of this world! Many of the successors of the Waldensians had now become Puritans within the established Church of England. Others, outside that church, had become Baptists. Some of the ministers of the early Sardis Era of God's Church — as already mentioned — maintained fellowship with these people. Jesus Christ was CONCERNED about the inevitable result of this relationship with the world that some of His people maintained. They allowed — even encouraged — the circulation of more and more false doctrine among His people, causing more to fall away! And having become "little horn men," THEY — like the prophesied "little horn" — joined in PERSECUTING God's Church! 2. Did Christ command His "Sardis" people to repent? Rev. 3:3. COMMENT: The Sardis Era of God's Church should have profited by the experiences of — and Christ's messages to — the Thyatira and Pergamos Eras of the Church before them. They should not have tolerated the unconverted and unbelievers in their midst! However, God's people throughout the Sardis Era felt they must always "have love" for those of differing opinions. They even invited them right into their meetings and asked them to speak! They did not realize that condoning falsehood — which does harm both to the believer and the hearer — is NEVER showing real love. That false concept is one of the primary reasons why the Sardis Church is "dead." 3. Did the Apostle Paul make it very plain that condoning evil in the Church is NOT "showing love"? Read I Cor. 5:1-13. What is the inevitable result of such practice? Verse 6. Did Christ warn the "Sardis" people that their ways would eventually leave them completely UNprepared for His second coming? Rev. 3:3. That happened! Consider, for example, the further history of the congregation founded by Francis Bampfield. For many years another separate seventh-day congregation also met in the same hall. One church met in the morning, the other in the afternoon. Through the years — and several changes of meeting place — the two congregations continued to use the same hall. They differed on the question of "Calvinism." ("The Seventh Day Baptists in Europe and America", page 65). For lack of qualified ministers, services were often conducted by the ministers of other churches. During one period, four DIFFERENT Baptist ministers preached to the afternoon congregation. Similar instances seem to have occurred in the morning church as well. Gradually the two congregations merged. The leaven of error was by now firmly entrenched in the Sardis Era of the Church of God. Later, this "combined" congregation merged again — this time with the so-called "Mill Yard church." Significantly, in the Mill Yard church building, also, there had been separate morning and afternoon services with separate ministers since 1754. And Mill Yard church records of that very year contain the earliest extant mention in England of a group known as "a congregation of Protestants dissenting from the Church of England, commonly called SEVENTH-DAY BAPTISTS" ("The Seventh Day Baptists in Europe and America", page 42, emphasis ours). That there were two separate groups of seventh-day churches in England during this time is also indicated by the fact that ministers were often required to be re-ordained to come from one Sabbath-keeping congregation to another (ibid., page xxiv). PHOTO CAPTION: Location of Sabbath-keeping congregations in England founded by 1730. The natural result was an almost total lack of feeding the flock of God, or promulgating His truth. No wonder Christ calls the Sardis Era "DEAD", for the Church was sound asleep spiritually! 1. What did God's people need in order to STRENGTHEN themselves and that which remained? Eph. 3:16. Also see Zech. 4:6, last part. COMMENT: Those in the Sardis Era needed more of God's Holy Spirit to strengthen them. But they neglected the gift of God. Error continued to weaken them. "With the eighteenth century, their zeal vanished" (Andrews, "A History of the Sabbath", p. 733). The cause? Being willing to remain in fellowship with false churches (p. 734). Sabbath keepers were never very numerous in England. By about 1800, they had become almost extinct again. As no "7th-day" pastor could be found in Europe, the three remaining English congregations imported an American. He led them to limited prosperity again, but no longer as the Church of God. They now called themselves Seventh-day Baptists. But before these early congregations were completely swallowed up in the Seventh Day Baptist denomination, Jesus Christ had caused His Church — the Church of God — to be established in America. Almost as early as local congregations are known to have existed in England, the Church of God in the Sardis Era spread to America. In 1664, Stephen Mumford was sent from the "Bell Lane" Church of God in London, England, to Newport, Rhode Island. For a while he associated with the members of a Sunday Baptist church, and persuaded several of them to embrace his views. After seven years, a seventh-day congregation of seven members was raised up from these people. They identified it as (a part of) The CHURCH OF GOD ("Seventh-day Baptist Memorial", p. 36, Vol. 1). PHOTO CAPTION: Location of earliest Sabbath-keeping congregations in America founded by 1745. It was not until much later that the MAJORITY accepted the Protestant idea that God's Holy Days had been done away. One of the most important local congregations was founded at Piscataway, New Jersey, in 1705. The record of its founding uses the name "the Church of God." The connection of this name and this local congregation with the Rhode Island headquarters is also clearly demonstrated by the fact that its minister was sent to Westerly for ordination ("Seventh-day Baptist Memorial", Vol. 2, No. 3, p. 121). At Shrewsbury, New Jersey, also, the record plainly speaks of "the Church of God dwelling at Shrewsbury" ("Seventh-day Baptist Memorial", p. 160, vol. 2, No. 4; Randolph, "A History of the Seventh Day Baptists in West Virginia", pages 19-20). At the same time, the Church was also called "the Church of Christ" (see Romans 16:16 for a Biblical usage of this name) or simply the Church at Hopkinton, or Newport, or Shrewsbury, etc. Outsiders sometimes spoke of the "Sabbatarian" church of such and such a place. But none of these was the OFFICIAL name. Christ shows that His people should be kept through the Father's name (John 17:11). This is why the official name is "THE CHURCH OF GOD." (Notice also the true name of God's Church in Acts 20:28; I Cor. 10:32; 11:22; 15:9 and Gal. 1:13). 1. Were there only "a few names" in Sardis who were truly dedicated, commandment-keeping Christians? Rev. 3:4. Are these individuals' names written in the Lamb's "book of life"? Verse 5. Will those wearing clean, white linen garments — a symbol of righteousness (Rev. 19:8-9) — be in the first resurrection and take part in the marriage of the Lamb? See the parable of the marriage of the King's son in Matthew 22:1-14. Notice especially verses 11 and 12. COMMENT: All during the eighteenth century, many other Sabbath-keeping congregations were being formed in America. But unfortunately many of the persons in these congregations had NOT become CONVERTED, nor acquired the habit of prayer and Bible study. They had merely accepted the doctrinal "argument" of the Sabbath. Among them were some individuals who had "crept in unawares" — just as they had in Jude's day (Jude 4) — for the express purpose of drawing away converts to their own style of belief. One of these was an "evangelist" who is very important historically in connection with the future development of the Seventh Day Baptist denomination in America. William Davis had studied at Oxford to become a clergyman of the Church of England, but changed his mind and became a Quaker instead. Migrating to Pennsylvania, he soon fell into disagreement with other Quakers. He then switched to the Baptists. Soon afterward he accepted the Sabbath and founded a seventh-day church near Philadelphia. Mr. Davis CAME AMONG the members of the Newport, Rhode Island, Church of God in 1706 and applied for membership. He was turned down on the grounds that he held wrong doctrines! Four years later he tried again at Westerly and was accepted, subject to approval by the annual meeting. Approval was finally granted, though some still objected. In 1713, he was authorized to preach and to baptize. But had this man become a true member of God's Church? His fruits show he had not. He was in trouble with the Church, and was "in" and "out" of fellowship for the rest of his life. He twice moved to Pennsylvania and back, lived in Connecticut for a while, and finally died in the midst of a settlement of his followers and children in New Jersey. To the end, he maintained the "rightness" of his own views and argued with God's Word. Listen to a bit of this letter he wrote, defending himself and accusing the truth. "Now all this enmity against ME among seventh-day men arose against ME originally from a noted seventh-day man and soul sleeper in this country, who ABOVE TWENTY YEARS AGO opposed ME about my principles of IMMORTALITY OF HUMAN SOULS, and afterward proceeded to differ with ME about my faith in Christ and THE TRINITY, who having poisoned several other seventh-day men with the mortal and atheistical notion, and set them against ME, he secretly conveyed this drench (enmity or accusation) against ME OVER TO WESTERLY to the persons beforenamed, ('old' Mr. Clarke, Joseph Crandall, Thomas Hiscox — the elders and pillars of the Church of God in Rhode Island), who, COMPLYING WITH HIM IN THEIR JUDGMENTS (doctrines) in the Socinian and Anti-Trinitarian error, drank it greedily DOWN BEFORE I CAME AMONG THEM ..." ("Seventh-day Baptist Memorial", Vol. 2, No. 3, pages 101-108, emphasis ours). Notice how he continually accuses his opponents of being "against" HIM, at the same time tacitly admitting it was really his false doctrines they were against — doctrines which were totally at variance to the truth the Church had long held "before (he) came among them." In later years, a host of his descendants and followers were to be found in New Jersey, New York, Pennsylvania and West Virginia. And this was how it came to be that as early as 1776 some Sabbath keepers began to take part in war (Randolph, "A History of the Seventh Day Baptists in West Virginia", pages 45 and 450) and believed in a Trinity and an immortal soul. They called those among them who knew the truth "soul sleepers" (referring to their disbelief of the false doctrine of the immortality of the human "soul"). By 1800, these and other Protestant doctrines were prevalent in the Sabbath-keeping congregations. Many began to try to ORGANIZE, so that at first seven or eight, and later a majority of the congregations united to form a denomination. This group officially adopted the name "Seventh Day Baptist" in 1818. Ten or twelve congregations — in the Pennsylvania to Rhode Island area alone — would not at first affiliate with this denomination of men. Even as late as 1828, only 16 to 20 congregations were being represented at the Seventh Day Baptist Conference meetings, while they spoke disparagingly of other — "fanatical and unworthy" — Sabbath keepers ("The Seventh Day Baptists in Europe and America", pages 153, 175). As always, the FEW had refused to go along, and had remained faithful to the name and doctrine of the Church of God! When Adventist expectations for 1844 proved to be an illusion, the Adventists split into a number of differing groups according to their various doctrinal backgrounds. The most important group, refusing to admit that they had been wrong about the date, accepted the idea that God's throne in heaven had been in need of "cleansing" at that time! A Seventh Day Baptist woman in New Hampshire called the Sabbath to the attention of some of these Adventists in 1844. But it was not until about 2 years after their great disappointment that the seventh day was widely publicized among them. The group as a whole then accepted the Sabbath. But they did not join the Seventh Day Baptists. Instead they began to assemble with the remnant of the Church of God with whom they had come into contact. This is shown by the fact that they GAVE UP their former belief in a Trinity, an immortal soul, etc. — doctrines in which the Seventh Day Baptists also believed. And they began to call themselves by the Biblical name, The Church of God. Their first songbook was dedicated to The Church of God. Some of them were active in publishing a periodical in the name of The Church of God. Those Adventists were never spiritually a part of the Church of God, however. They had only associated themselves with God's Church for a season. Later, the majority of them began following a woman whom some considered a prophetess. In 1854, they began to set a price on and to sell their religious literature — even though Christ tells His true ministers to "FREELY give" (Matt. 10:8). In 1860 they rejected the name "The Church of God" and officially adopted the name of Seventh Day Adventists. As before, a few faithful members — but only the few — of the Church of God did not go along. 1. Were some of the Adventist doctrines prophesied for the "latter times"? I Tim. 4:1, 3. Note particularly the one forbidding the eating of meats. COMMENT: Every one of the points prophesied here was not necessarily fulfilled at the same time or in a single group of misled people. But each of these points HAS been fulfilled in one group or another which departed from the truth in the last few centuries. 2. Does the Bible say these people were being deceived by DEMONS? Same verse. COMMENT: The early history of this movement clearly reveals the kind of spirit behind it. In its early days the supernatural power of demons was manifest. For example, in Norway and Sweden, children — too young to have yet experienced true conversion — were influenced to preach and spread the church's doctrines. Some of them were no more than 6 or 8 years old (E. G. White, "The Great Controversy", p. 366). The New Testament Church which Jesus built NEVER HAD CHILD MINISTERS! They were always men mature enough to have been taught, trained, tried and tested. God's ministers are all ELDERS — not "children" (see Acts 14:23; Titus 1:5). 3. Even in Old Testament times, did God's ministers — the Levitical priests — have to be mature men? Num. 4:2-3, 22-23, 29-30, etc. Also Num. 8:24. How old was Jesus Himself when He began His ministry? Luke 3:23. COMMENT: Notice how one of those poor, deluded, misused children later described his experiences: "Preached! Yes I HAD to preach. I had no devising in the matter. A power came upon me, and I uttered what I was COMPELLED by that power to utter." Another, who was 15 years old when these events occurred, related: "As soon as we were SEIZED by this heavenly power, we began to speak to the people, and to proclaim with a loud voice that the judgment hour had come" (Emma Howell Cooper, "The Great Advent Movement", pages 22-23, emphasis ours). 4. But now COMPARE! When GOD uses a human being as His spokesman, is the spirit of God in that speaker SUBJECT TO THE MAN'S CONTROL? I Cor. 14:29-32, 37. Recall that only a FEW remained faithful in the Sardis Era of the Church of God (Rev. 3:4). When the Adventists organized themselves as a denomination in 1860, only a few — mostly in the states of Ohio, Iowa and Missouri — did not go along. The printing plant and the magazine formerly published in the name of The Church of God were taken over by the Adventists. But a group of the faithful in 1861 began the publication of a new monthly paper called "The Remnant of Israel", later changed to the "Sabbath Advocate", and finally the "Bible Advocate". Soon these people, greatly influenced by the Protestants around them, again began to organize themselves into a general conference and various state conferences. See Mead's "Handbook of Denominations in the United States", article "Church of God (Seventh Day)." Through the remainder of the century their numbers slowly increased, though they still remained relatively few. Certain strong families provided the Church of God a tenuous continuity. These came to be located mainly in Missouri, Oklahoma and Oregon. SOME of them retained a knowledge of God's Holy Days and the identity of modern Israel. During the same period, Church of God ministers began missionary-like work in Mexico, Chile, Argentina, the Philippines, etc. A few thousand of their converts and/or their descendants remain throughout Latin America to this day. Spanish-speaking congregations in Chile and Argentina kept the Holy Days continuously from their beginning in the 1890's until the middle of the twentieth century. But for 70 years after the departure of the Adventists, the Church in the United States remained spiritually powerless. 1. Did Christ find the Sardis Era lacking in spiritual works? Rev. 3:2. COMMENT: A characteristic of the modern remnants of the Sardis Era of Christ's Church is the lack of true spirituality. AS a whole, this era of the Church of God did not "remember HOW" it had received the truth from earlier Christians who were FAITHFUL even to death by fire. Nor did it, like those, "hold fast" what truth it had. It did not emphasize repentance (verse 3). It did not "watch" (verse 2; Matt. 25:13). During those last 70 years, only a few individuals really repented and strengthened the truth that was ready to perish in their midst. Most of their ministers, instead of yielding themselves to be used by God, tried to carry on a work by their own human power. At the end of the era, many of them were only seeking an income for themselves. They were not diligently seeking to serve God. These ministers had rejected God's government, having lost the knowledge of HOW CHRIST GOVERNS His Church. They absorbed the PROTESTANT IDEA of democracy applied to church government — with its accompanying divisions, controversies and selfishness. The result of rejecting Christ's direction was increasing doctrinal deviation and lack of true conversion among the members. These were the people Mr. Herbert W. Armstrong came in contact with in 1927. Mr. Armstrong had been very successful in business as a younger man. But three times God had swept his business away in order to humble him. Then God called and converted him. Six months before his conversion, an elderly woman who was a member of the "Sardis" Church in Oregon introduced Mrs. Armstrong to the truth about God's Sabbath. Mrs. Armstrong gladly accepted this truth because God had opened her mind. But Mr. Armstrong was anything but pleased. He was worried about what their friends would think! Mr. Armstrong was challenged to study the Bible for the first time in his life. He tried to disprove this seemingly "crazy, wacky" notion that his wife had accepted. Instead, he found the Sabbath absolutely proven to be the day God commands us to keep holy today. He came to the conclusion that if the Bible be true, the Sabbath MUST be kept on the seventh day. That led to proving the existence of God, and that the Bible is indeed His Word. He studied each question intensively, from all angles. That initial intensive study lasted six months. Immediately Mr. Armstrong began to search for the one true church which he knew must exist. Somewhere there had to be the church Jesus Christ said He would build (Matt. 16:18). These Church of God people in Oregon SEEMED TO HAVE THE TRUTH — certainly they were the closest of any. But something was wrong. They were spiritually DEAD! Consequently, Mr. Armstrong never "joined" their organization. But he began to fellowship with the people. He was asked to speak to them, and was finally ordained by the Oregon Conference of the Church of God in June, 1931. 1. Is the gift of the Holy Spirit promised to those who have truly repented? Acts 2:38. And is one of the functions of the Holy Spirit to lead and guide Christ's Church into all TRUTH? John 16:13. COMMENT: As soon as Mr. Armstrong was baptized, the fruits of the Holy Spirit began to be manifest in his life. He continued to study and prove all things, as we are instructed to do in I Thessalonians 5:21. As he studied, much of the truth which the Sardis Church had allowed to perish began to be brought to his attention by God's Spirit. Immediately he began to expound this knowledge to the remnant of God's people in the state of Oregon. God revealed the true identity of the modern House of Israel to Mr. Armstrong. He also came to see that God's ANNUAL Festivals were commanded to be kept today ALONG WITH the weekly Sabbath. He began to understand their meaning. But it was SEVEN YEARS before any others in Oregon kept God's ANNUAL Sabbaths with Mr. and Mrs. Armstrong. By 1933, it was obvious to many that voting their own leaders into office was not God's way, and that it had led only to confusion. In an effort to strengthen the hands of MEN at the top, it was decided to REORGANIZE the Church. Government of the Church was to be placed in the hands of "twelve to look after the spiritual affairs of the church, and seven to take charge of the financial business, and also the seventy to go forth two by two in giving the warning message for the hour" (Dugger and Dodd, "A History of the True Church", p. 299). A reorganization meeting was scheduled to be held in Salem, West Virginia. The date — November 4, 1933. An appeal was made to the "lot" (in an attempt to follow the singular case in Acts 1:23-26) to choose from among the names presented. Prior to the meeting, a call for prayer had been sent to God's people around the world "that God would again choose men to lead His Church as in the former time." God ANSWERED that prayer! But NOT in the way they expected! As the hands of the clock neared high noon on that fateful Sabbath day, the drawing of names for the "seventy elders" reached number FORTY. The fortieth name was "Elder Herbert Armstrong of Oregon" ("The Bible Advocate", Nov. 6, 1933, page 5). No one knew it then, least of all Mr. Armstrong, who was not present at the meeting, but JESUS CHRIST HAD MADE HIS CHOICE — with the number forty — of a man to REVIVE His Work in the end time. Forty signifies the completion of testing. Now the time of trial and test for the Sardis Church had run out. And as with ancient Belshazzar, the Sardis Era of God's Church had been "weighed in the balance and found wanting" (Dan. 5: 27). The reorganization by men in 1933 was never to be a success. In just a few years that Church had permanently disintegrated into several ineffective fragments, neglecting much of God's truth. 1. As a result of neglecting to "watch," is the last generation of the Sardis Era going to be surprised when Jesus Christ SUDDENLY returns? Rev. 3:3. 2. Are WE TODAY told to learn from Christ's message to "Sardis," and from the sad experiences of this era? Rev. 3:6. COMMENT: There are important SPIRITUAL LESSONS to be derived from all of these things. So diligently study this lesson and all scripture references to see HOW these spiritual lessons apply to you personally. The world did not notice the Sardis Era of God's Church because it did not proclaim the gospel with POWER. It did not exploit the possibilities opened to it by the development of printing. The great multiplication and distribution of printed Bibles, though it occurred during this era, was not accomplished by the Church of God, but by various Bible societies. Christ saw to it that the Word of God was MADE AVAILABLE to the world. But it REMAINED for His Church to MAKE THAT WORD UNDERSTOOD! For this purpose He now raised up a special Work in His Church. At the critical moment when the Church of God in the Sardis Era was breaking up, the living Jesus Christ separated a mere handful of people in Oregon to begin the present "Philadelphia" Era of His Church (Rev. 3:7-12). He began to USE Mr. Herbert W. Armstrong, and the small group He had called to assist as co-workers, to reach the world with the good news of the coming Kingdom of God. 1. Did Christ promise to set an "open door" before the Church in the Philadelphia Era? Rev. 3:8. COMMENT: The "door" mentioned here is an opportunity to disseminate Christ's gospel (see I Cor. 16:9; Col. 4:3). Christ opened the "door" of RADIO to the Philadelphia Era of His Church. Since the first Sunday in January, 1934, THE WORLD TOMORROW broadcast has never missed a week on the air. And now the message goes out also on television — an even GREATER "door." This Church Era has "(only) a little strength" of itself (Rev. 3:8), but it is MAGNIFIED greatly through the modern "doors" of radio, television and the printing press — and most important of all, through the POWER of the HOLY SPIRIT! 2. Does Revelation 3:8 imply that some people actually want to SHUT the "door" Christ has opened to the "Philadelphia" Church? But will they be able? Same verse. In the end, will even the "synagogue of Satan," which has persecuted and killed God's servants through the ages, have to bow at the feet of the "Philadelphia" Church? Verse 9. COMMENT: The history of the Philadelphia Era need not be covered IN DETAIL in this lesson, as it is readily available in frequent articles in THE PLAIN TRUTH magazine and in our other free literature. The Era of "Brotherly Love"
PHILADELPHIA means "brotherly love" or "those who love their fellowmen as brothers." It expresses the characteristic which is the motivating zeal of the Philadelphia Era of God's Church. The Church shows love to mankind by carrying out God's commission — that of warning the world of the impending destruction that hangs over it. It is revealing HOW Jesus Christ will soon rescue humanity from cosmocide and teach man the way of peace, happiness and prosperity. The goal of the "Philadelphia" Church is the ultimate salvation of all mankind! 1. Has this Church "not denied" Christ's NAME (including His nature, character, personality and power), and KEPT — that is, both believed and PRACTICED — His Word? Rev. 3:8. 2. Is "Philadelphia" promised a SPECIAL reward? Rev. 3:12. COMMENT: It is significant that the ancient Anatolian city of Philadelphia still lives today, unlike dead Sardis. Its Turkish name, ALLAH SHAIR, indicates the destiny of the Church it portrays. Translated it means "the CITY OF GOD"! 3. Will the overcomers of the Philadelphia Era be "PILLARS" in the temple of God in New Jerusalem? Same verse. COMMENT: The two pillars in front of Solomon's temple — Jachin and Boaz (I Kings 7:21) — represented STABILITY and STRENGTH. And as Peter, James and John stood out as "pillars" among the congregation in 49 A.D. (Gal 2:9), the Church of the Philadelphia Era is to stand out EVEN MORE in time to come! 4. Is the "Philadelphia" Church promised a place of safety for her faithful service and obedience? Rev. 3:10 and 12:14. COMMENT: As the ancient city of Philadelphia has been kept from destruction to this very day, so will the "Philadelphia" Church be preserved from the Great Tribulation which Satan will soon bring upon all the earth. 5. When those in "Philadelphia" are taken by God to a place of safety, will another part of God's Church be left behind? Rev. 12:17. PHOTO CAPTION: The Jeans School, west of Eugene, Oregon. Those converted during the first evangelistic meetings held by Mr. Armstrong met here on God's Sabbath. They composed the first "congregation" of the Philadelphia Era of God's Church. COMMENT: The "remnant" left behind will constitute the seventh and last era of God's Church — the "Laodicean" Era — which will last but a very short time. Notice what has happened, since 69 A.D., to the preaching of the true message of God's coming kingdom. Instead of proclaiming that message worldwide, the Church as a whole went to SLEEP! Only briefly, as during the days of Peter Waldo, the Church stirred in her slumber, but did not fully awaken to do the Work of God. The parable in Matthew 25 EXPLAINS this long slumber. Turn to it and read through the first 13 verses. The "virgins" represent the members of God's Church through the ages. The Apostolic Age expected Christ's return momentarily (I Thes. 4:15). But when He did not immediately appear, they grew drowsy, lost their first love (Rev. 2:4) and went to sleep on the job. 1. But at the end of the Work of "Philadelphia," will many lack a sufficient supply of "oil" (the Holy Spirit)? Matt. 25:8. 2. Are the five unprepared "virgins" told to go and figuratively BUY a supply of the Holy Spirit? Matt. 25:9. Does Revelation 3:17-18 show that the typical Laodicean also belongs in this category? COMMENT: These members of God's Church can still be born of God if they do as Christ instructs. But they will have to PROVE their spiritual dedication to God by overcoming in the midst of the Great Tribulation — very likely through martyrdom! Matthew 25:10-12 indicates that SOME of the end-time "foolish virgins" will not yet be "ready" when Christ arrives. 3. In spite of Christ's warning and the constant repetition of the message by the Philadelphia Work over a period of years, is the spiritual condition of the "Laodiceans" just LUKEWARM — neither hot nor cold, not really stirred up about overcoming? Rev. 3:15. 4. WHY will the Laodiceans find themselves in such a pitiable state? Rev. 3:17. COMMENT: They will have been self-deceived. They "know not" that they themselves are "the ones pitiable and beggarly and blind and naked" (according to the original Greek). They THOUGHT they HAD made proper preparation for the return of Christ. They will say, "I HAVE BECOME rich (physically and spiritually) ... and have need of NOTHING." The ancient city of Laodicea was famous for its money transactions and its soft wool. Laodicea was almost a synonym for soft, luxurious living. Not far from the city was a pagan temple with a great MEDICAL school. Naturally, Laodicea produced some famous SKEPTIC philosophers! The MODERN "Laodiceans" will be products of this MODERN age of skepticism, unbelief, creature comforts, medicine and permissiveness. They are too close to the ways and false gods of this world to get really "shook up" about God's truth until finally shaken out of their lukewarmness by having to suffer in the Great Tribulation! 5. Will Christ be showing LOVE to these people by allowing them to suffer so? Rev. 3:19 and Heb. 12:6-11. COMMENT: The Laodiceans actually have been begotten of God's Spirit. Their lamps are lit (Matt. 25:8), but are "going out" (see margin of your Bible) because the supply of "oil" (the Holy Spirit) has not been continually replenished and increased. Christ does NOT WANT to cast off these people. Revelation 3:16 should be translated "I AM ABOUT TO spue thee out," NOT "I WILL spue thee out." He stands ever ready to receive the OVERCOMERS — to give them eternal life and rulership with Him (verses 20-21). 6. How might a "Laodicean" recognize his spiritual condition in advance of the Tribulation? Luke 6:26. But will the world HATE whoever is a dedicated believer in, and doer of, God's Work? John 15:19-20. What else does Christ say, through the Apostle Paul? I Cor. 10:12 and II Cor. 13:5. 1. Did Christ affirm that "Elijah" must come before His own return? Matt. 17:11. Is his job to "restore"? Same verse. COMMENT: Note that Christ is not speaking of the original Elijah. John the Baptist, who was a type of "Elijah," came "IN THE SPIRIT AND POWER of ELIJAH" (Luke 1:17). John the Baptist did a one-man work. But today God works through the Body of Christ — the Church composed of MANY MEMBERS (Eph. 4:12, 16). After Christ's ministry on this earth, it was no more a single individual that did God's Work (through the power of His Spirit), but the Church — the BODY of Christ. John the Baptist, the "Elijah" of his day (Matt. 17:12-13), was one man. But Christ founded God's CHURCH. After Pentecost, 31 A.D., the "body" of Christ, with various "members" like the hands, fingers, toes, etc. of a human body, did the work that one man used to do. Today the "body" of Christ — the entire CHURCH OF GOD, through its VOICE, its PRAYERS, its TITHES and OFFERINGS and its various other functions — is heralding Christ's imminent return (Matt. 25:6). 2. What else will the "Elijah" of our day do? Mal. 4:5-6. COMMENT: This is being done through the dissemination of the knowledge of proper child rearing methods, and the principles governing legitimate and happy family relationships. And the hearts of both parents and children are being turned back to the GOD of their fathers Abraham, Isaac and Jacob. THIS IS WHAT THE "PHILADELPHIA" ERA OF GOD'S CHURCH IS DOING TODAY! 3. Is this what the original Elijah did? Read I Kings 18:20-40. COMMENT: Elijah RESTORED the true religion which in his day — as in the "Sardis" Era — had been nearly lost, turning the hearts of the people back to their fathers and their God. 4. Had Elijah begun to train young men for the work to be done? II Kings 4:38. COMMENT: The expression "sons of the prophets" refers to young men being trained to continue the work of those whom Jezebel had killed (see I Kings 18:13). Remember, Jeroboam (I), king of Israel, had long before rejected the Levites from being priests and teachers. God had to use other men in the House of Israel to do His Work. But they had to be trained! 5. Were there THREE schools for the training of these men? II Kings 4:38 and 2:1-5. And did the students all know when God was about to take Elijah away and leave Elisha in charge? II Kings 2:3, 5. 6. What would happen to the earth if it weren't for God's Church and the work it is doing today? Mal. 4:6. Notice especially the last part of this verse. Note that the word translated "curse" in Malachi 4:6 is the same word used in I Kings 20:42 and Zechariah 14:11. It means "complete and TOTAL destruction" — UTTER ANNIHILATION! Except for the presence and prayers of God's people, this "present evil world" (Gal. 1:4) WOULD experience "utter destruction"! We need to realize just how important it is for each of us to personally overcome and plunge WHOLEHEARTEDLY into God's present Work. HOW MUCH of this present world's population survives the coming holocaust and lives on into the World Tomorrow depends a GREAT DEAL on the effectiveness of this present Work in reaching the world with the good news of God's coming kingdom — and on the NUMBER converted during this age who will be available to teach and serve those who survive! WE HAVE ONLY A VERY SHORT TIME LEFT. Think how much depends on YOU — on YOUR prayers — YOUR efforts — YOUR tithes and offerings!